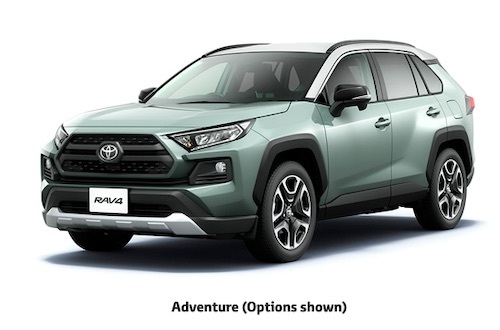 Toyota City, Japan, Apr, 10 2019; Toyota announces the launch of its completely redesigned RAV4 in Japan and the start of sales at all nationwide Toyota "Corolla" and "Netz" dealers, and Toyota Mobility Tokyo, Inc. The first-generation RAV4(4) debuted in 1994, when body-on-frame four-wheel drive vehicles were positioned as off-road vehicles. The RAV4 would go on to play a pivotal role in the development of a new market for the passenger-friendly sport utility vehicle (SUV/crossover SUV). New models continue to be launched in the ever-expanding crossover SUV market. Based on creating a "Robust Accurate Vehicle with 4 Wheel Drive," the new RAV4 development concept blends the power and sophistication of an SUV, achieving top-class generous rear cargo space and outstanding driving performance realized by a new 4WD system. The elevated cabin design emphasizes passenger convenience, featuring easy-to-use open trays and cup holders. The latest Toyota Safety Sense preventive safety package comes standard in all models, and the available Connected Services offer a safe, secure, comfortable, and convenient drive experience. The world's first Dynamic Torque Vectoring AWD system enables precise and stable steering by adopting a torque vectoring mechanism, which independently distributes torque to the left and right rear wheels according to driving conditions in addition to the front and rear wheels. It also incorporates a disconnect mechanism that transmits driving force to the rear wheels when 4WD driving is deemed unnecessary, significantly reducing energy loss and improving fuel efficiency. The chief engineer in charge of development, Yoshikazu Saeki, explains, "We aimed to develop a car that stimulates the curiosity of customers, inspiring their desire to try something new and to experience the joy of driving anywhere, anytime, and as far as they want." (1) Comparison in mid-size SUV class. As of April 2019 according to Toyota Motor Corporation. (2) World's first adoption of a disconnect mechanism that uses a ratchet-type dog clutch on both the front and rear wheel shafts for disconnection. As of April 2019 according to Toyota Motor Corporation. (3) Equipped in G "Z package" and Adventure. (4) RAV4 stands for Recreational Active Vehicle 4 wheel drive. The RAV4 combines stylish design and drive comfort to evoke the joy of driving in both off-road and urban settings.